On the picturesque island in Thailand Co., the CoC is a stunning resort center Soneva Kiri. 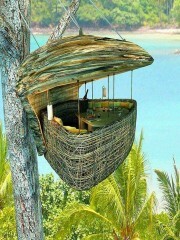 There is unusual restaurant Treepod Dining. He is known as the Bird's Nest. There you can taste the delicious and exotic dishes of Thai cuisine. You may snacking while you are in your peculiar nest of five meters in height. The basket is woven from rattan stalks stable and accommodates up to 4 people. To accommodate the table in the nest customers are located on the floor his then special mechanism rises wicker basket in the air. So you're in the arms of tropical greenery. Prior to ascend into the air, the staff will kindly ask you to put your seat belts. From a bird's eye will be able to enjoy the unique view of the rainforest, azure sea, the coastline and the various species. Only wind noise can distract from the beauty that surrounds you. Particular attention should turn the process of service - waiters are real acrobats. If guests want to order something, they ordered waiters who are NOT show a special platform a few meters away from the table. For waiters it is important to be agile, fearless and have athletic qualities. Meals are the themes of the jungle.